Though Jews arrived in Port Gibson as early as 1839, it was not until 1859 that 22 Jews gathered to sign the charter for their congregation, which they named Gemiluth Chassed (“Acts of Loving Kindness”). Until this time, all Jewish activity was confined to private homes. It is unclear whether the Jewish stores stayed open on Saturdays during this time period, but by the 1880’s and 1890’s, almost all of the Jewish owned stores stayed open on Shabbat. In 1871, a Jewish Cemetery was purchased for $300 by Louis Kiefer, Mayer Bock, and Moses Kaufman. Previous to this purchase, the deceased members of the Jewish community were interred in the Jewish Cemeteries of either Natchez or Grand Gulf. Also in 1871, the Congregation moved to provide Jewish education for their children and hired Henry Mayer of Cincinnati Talmid Yelodim Institute to run the school. 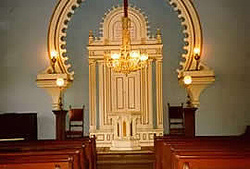 In 1874, the congregation joined the Union of American Hebrew Congregations, and formed chapters of both B’nai Brith and the Free Sons of Israel. Despite having both a school and a cemetery, Gemiluth Chassed did not have a permanent building until 1892. The plot of land was purchased on Church Street in 1887, and finally, on January 3, 1892, the Cornerstone for Temple Gemiluth Chassed was laid. The building, which was reported to have cost $12,000 is known for its unique Moorish style architecture. At the opening ceremonies for the temple, Rabbi Max Heller came from New Orleans to give the dedicatory sermon. The first of these short term rabbis was Jacob S. Raisin, who took the job at age 22, just after graduating from Hebrew Union College in Cincinnati. Raisin expressed a strong dislike for the region, and was particularly struck by the area’s system of racial injustice. He felt unchallenged by the small congregation, but his largest frustration was that his limited salary made it impossible to start a family. After a few years, he finally found a new position, and served at least four other pulpits over the next 50 years. The negative musings of Rabbi Raisin shed light on the difficulties that faced Gemiluth Chassed, particularly limited finances and problems securing rabbinic leadership. The last four Jews left Port Gibson in the late 1980s, and in later years, the Jewish practice of the remaining community members varied greatly. Some observed the High Holidays and Shabbat in their homes, while others stopped practicing altogether. Many took a path in the middle, maintaining some customs while allowing others to fall away in favor of assimilation. Some of the last Jews did not keep strict kosher, yet they would not have pork in their home. Some had Christmas trees in their homes. When the congregation closed, they donated their Torah and other artifacts to the Museum of the Southern Jewish Experience in Utica, Mississippi. In 1986, when the Jewish population of Port Gibson had dwindled to two, the congregation officially closed. Their historic synagogue was about to torn down to make way for a parking lot, when a local non-Jewish couple stepped in and purchased the building to preserve it. The proceeds from the sale helped to restore the Jewish cemetery on Marginal Street in Port Gibson. On October 20, 1991, the Synagogue hosted a celebration of the buildings 100th anniversary. The ceremony included both Jewish and non-Jewish speakers who discussed the many issues that face small town Southern Jewry, and emphasized a cross cultural commitment to historic preservation. 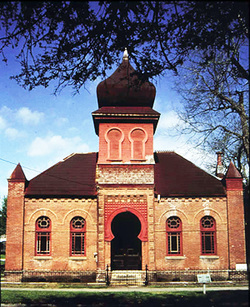 Although no Jews currently live in Port Gibson, the synagogue serves as a reminder of the important role that they played in Port Gibson’s history.